Volume 2 "New York (1850-1871)"
This book was originally published, in Italian, by Seat, then a subsidiary of the STET Group (now Telecom Italia). The original title was “Antonio Meucci—L’inventore e il suo tempo” (“Antonio Meucci—The Inventor and His Times”). It came in two volumes: Vol. 1 subtitled “From Florence to Havana” issued in 1994, and Vol. 2 subtitled “New York 1850-1871,” issued in 1996. After Seat’s reorganization in 1998, the publication of this book, as well as the publication of its English version was canceled and the copyright of the whole was returned to the author, Basilio Catania. Volume 1 (at left in the figure above) dealing with the first 42 years of Meucci's life, that he spent party in Florence (1808-1835) and partly in Havana, Cuba (1835-1850). Volume 2 (at right in the figure above) dealing with Meucci's first 21 years in New York (1850-1871), namely from his arrival in New York from Havana (May 1, 1850) up to the disaster of the Westfield ferry in Manhattan (July 30, 1871), where he was severely injured, laying for many months in danger of life. Volume 3 (unpublished), subtitled "New York 1871-1889," would cover the rest of his life in New York up to his death (October 18, 1889), with special emphasis on the trials about the invention of the telephone. Volume 4 (unpublished), subtitled "Post Mortem" would report on all of the events happened after Meucci's death, including the development and outcome of the US vs. Bell trial, as well as all attempts by Marconi, Moncada, Respighi, Schiavo, Catania and others to vindicate his memory. The CD-ROM (unpublished), titled "Documentary Evidence," would be included in the fourth volume and would contain good part of the documents retrieved by the author, especially the relevant records of the Bell vs. Globe trial and those of the US vs. Bell trial. Although the copyright was finally returned to the author, he could not find an alternative publisher of all the above (mostly due to the size of the whole work) and he therefore decided to post on Internet volumes 1 & 2, translated in English, to let them be freely consulted by a large audience. The unusual extension of the book was motivated by the fact that, in the past, Antonio Meucci's story had been much controversial and that many findings from the author's extensive research were quite hard to be accepted, This applied even more so to the scientific community, by whom Meucci had been largely neglected. Therefore, the author managed to put in his book every possible aspect of Meucci's story, corroborating any statement by original documents, to offer the audience means to verify the author's statements. 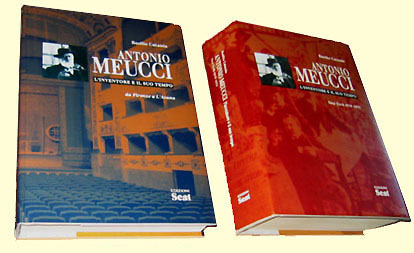 The title of the book "Antonio Meucci, the Inventor and His Times" was chosen to point out that, in addition to Meucci’s life and acievements, the social, political and technical environment in the various sites where he lived and invented, as well as its evolution all along his life is duly represented. Moreover, in the numerous and extended Appendixes of the book, the history of the various technologies in which Meucci had engaged is accurately reconstructed, in order to correctly collocate and evaluate his inventions. The electronic version of this book is reported here in PDF format. The page size is the Europe standard A4, although the actual print area is 17 x 24 cm (6.8" x 9.6"), same as the printed version in Italian. You can therefore print each page in either A4 or US-Letter size paper without loosing any part of the book. Each section of the book is divided into three parts: “Main Text,” “Appendixes,” and "Indexes and References." The Main Text is essentially descriptive, apart some short inserts on specific topics. The Appendixes are quite technical and devoted to more demanding readers. "Indexes and References" contain: Acknowledgements, Picture credits, Archives consulted, General Bibliography, Analytical Index and Table of Contents. Please, note that the Analytical Index is not essential for this electronic version, since the reader can use the "Find" command of his/her computer to retrieve information on specific items. It was anyway included here as a translation of the Analytical Index of the paper version in Italian, and therefore bears the page numbers of that version. On the contrary, the “Table of contents” reported at the end of the "Indexes and References" of each volume correctly reports the page numbers of the electronic version. You can read the whole book without seeing any image. If you want to see an image, you must click on the small red button that is reported at the end of its caption, and the image will appear in full screen. You can then go back and continue reading the text by using the "Back" command of your browser. To read the text, click on the desired chapter as listed on top of this page. Please, note that this electronic version is not the exact translation of the printed Italian version of the book. In fact, some errors in that version have been corrected and new information has been added, though in modest amount.